Ski boots are an essential part of equipment for any skier. No matter if you are a beginner or expert, well-fitting boots are a must. In addition to skis, the boots will be one of the first purchases you'll make. While most resorts allow you to rent equipment such as boots and skis for the duration of your stay, many skiers prefer to bring their own. All ski boots are basically designed the same way. They have a tough outer shell and a soft, removable sock as a liner. Different manufacturers sell boots in a variety of colors and patterns. Keep in mind that boot fit is far more important than fashion when you're heading out for a day on the slopes. Ski boots come in three basic styles: rear, mid, and front entry. Each style differs in the way that they are put on and may have specialized features. Rear entry boots offer the easiest access for skiers. Simply pop a catch on the back of the boot and your foot is able to slide into the boot. Rear entry styles are becoming less common and many manufacturers have stopped making them in favor of the stronger and more versatile front entry boots. If rear entry ski boots are your preference, you may be able to find a pair on a site such as eBay. Front entry boots reach further up the ankle than rear entry styles. Front entry boots are fastened to the front of the foot using buckles over a thick, padded tongue. This is the type of boot most preferred by skiers and generally said to offer the best overall performance. At the midway point between rear and front entry ski boots, you'll find mid entry boots. Mid entry boots have an opening to the front and back of the boot. They are often chosen by beginners who aren't quite ready to move onto a front entry style of boot. Altrec: Altrec boots are available in men's and women's styles. Boots are priced from $300 to $700 and come in alpine, touring and telemark lines. Atomic: Atomic makes boots for the entire family in race, freeski and all mountain styles. Most boots are priced from $300 to $600. Atomic boots are popular among racers and those looking for an innovative boot sure to keep up with them on the slopes. Dalbello: Dalbello makes boots for men, women, kids and teens. These boots made in Italy are done in performance styles that offer not only durability but a fashionable look as well. Dalbello boots come in racing, high performance, freestyle, sport and big mountain styles and range in price from around $500 to $900. A pair of Dalbello boots are sure to give a skier optimal comfort and control no matter what their skill level may be. Nordica: Nordica boots come in front entry, racing, mountain and freeski styles and in sizes for men, women and juniors. Most styles are priced between $400 and $700 and reflect the latest trend in skiing. Nordica's long history of making ski equipment guarantees that their boots are designed for not only comfort but performance as well. Lange: Lange is well known for both ski equipment and boots. This reputable brand offers boot styles for men, women and juniors in styles such as freeride, race, all-mountain and adventure. Boots can be found in a range of prices from $300 to $500. Lange strives to keep up with the latest ski innovations and features a line of boots for skiers of all abilities and styles. Salomon: Salomon boots come in styles for men, women and kids in racing styles, free ski styles and those suitable for all mountain terrain. Boots are priced from $200 to $500. Salomon is well known for a range of sports equipment and is a trusted brand for those serious about the sport. Salomon Divine 55: This women's ski boot is priced under $200 and is perfect for all day skiing. It features a thermoformable wool liner to keep your feet warm and comfortable and has a soft flexible shell. This boot is ideal for beginner to intermediate skiers. 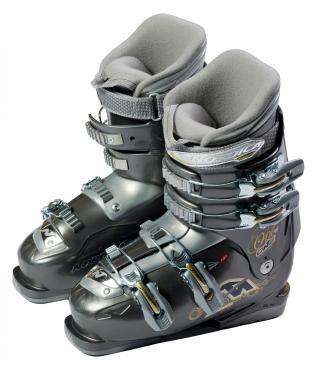 Dalbello Voodoo Ski Boots: These boots for men are priced around $350 and are great for intermediate, freestyle skiers. These boots provide shock absorption and have a Dynalink Retention System to give skiers less foot sliding. Atomic Tracker 110: This ski boot designed for women is priced around $500. This boot features a Power Control Release that can switch between touring and ski mode making it ideal for all conditions and terrain. Other features include a female-specific liner and a stiff, flexible outer shell. It is essential to not only your comfort but your safety that the boots you wear for skiing fit properly and securely. You do not want to risk having your boot come loose while heading down the slopes. For that reason, the fitting of the boots is extremely important. Your boots should hold your foot firmly in place and be rigid enough to support your ankle, but not so rigid that you can barely move. Wear a sock that is not too heavy when getting fitted for a boot. You will want to wear a sock designed to keep moisture wicked away from your skin and able to keep your feet warm while skiing. Try out the boot for at least 10 minutes to see how it feels. If it rubs or is uncomfortable, try out another style of boot. Be sure that the boots allow you to bend forward and back and that the tips of your toes do not touch the end of the boot while leaning forward. If you are in doubt about your boot size or how a boot should fit, go to a local ski shop and have a professional fit you for the first time. Boots are the most important piece of skiing equipment and add to your overall ski experience. It is essential for boots to fit properly in order to enjoy your time on the slopes in a safe and comfortable manner. Boots can improve your ski performance and give you stability and control. Boots that do not fit properly can pose a danger and make it difficult for you to enjoy your time skiing.